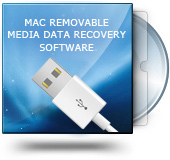 Description : Purchase Mac Removable Media Data Recovery Software to regain audio, video songs, mp3 music, text documents, pictures etc lost due to human mistakes, logical errors, accidentally formatting/reformatting USB drive and similar data loss incidents. Supports data recovery from: USB drive, External hard disk drive, Memory card, PDA device, Digital Audio Player, Mp3/Mp4 Player etc. Removable media data restoration program fully compatible to work with all major manufacturers of USB digital media including: Kingston, SanDisk, Transcends, IBM, Toshiba, Kingmax, Jet flash, Sony, Dell, HP, Samsung, Lexar and many more.